July 4th is a day of extremes: one of celebration, barbecues, and holiday for many, on one hand. 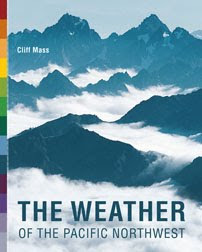 And substantial environmental dangers on the other: wildfires, degraded air quality, lost pets, and injury. A little care can reduce the dangers considerably, most of which are associated with the personal use of fireworks. 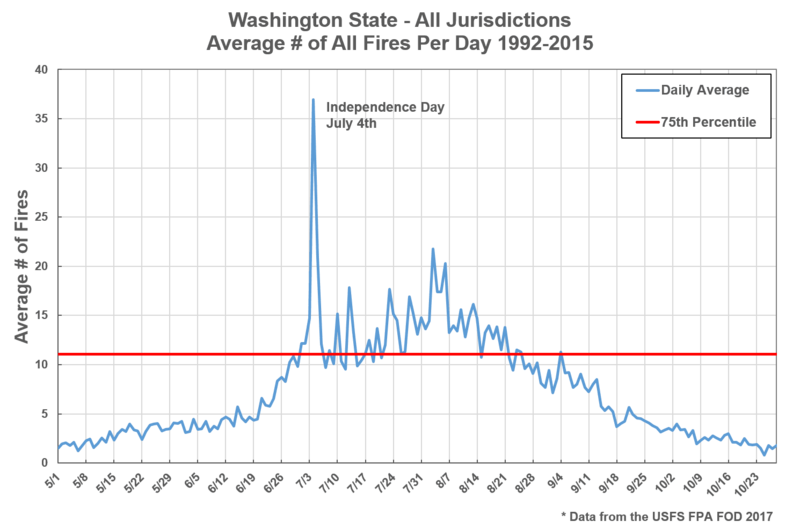 Let me start by showing you the average number of fires per day over Washington State, for the period from 1992 to 2015, provided by Josh Clark of Washington State's Department of Natural Resources. First, here is a plot of all fires from all causes. 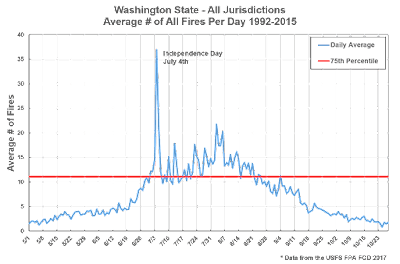 A huge spike on July 4th...the biggest fire initiation day of the year. Wonder why. In case, you are in suspense, the plot for human-caused fires is below...July 4th is dominant. 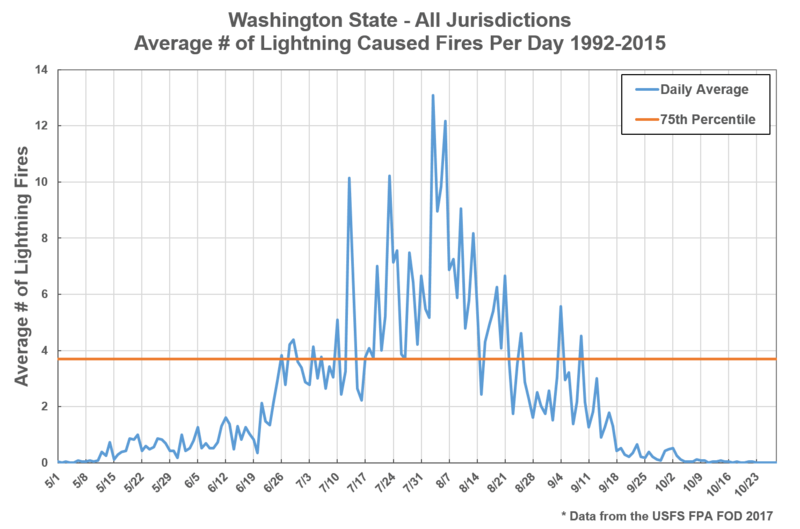 The most important cause of natural fires is lightning, and here is the plot. 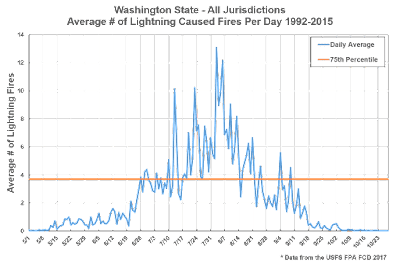 Peak lightning fire initiation is in late July and early August when the ground has dried and the surface temperatures are the highest. Next, lets consider air quality. 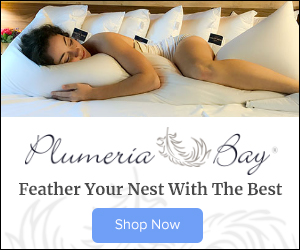 The combination of large community fireworks display and thousands of "private" shows results in a huge degradation of air quality late on July 4th and the morning of July 5, particularly in urban areas. 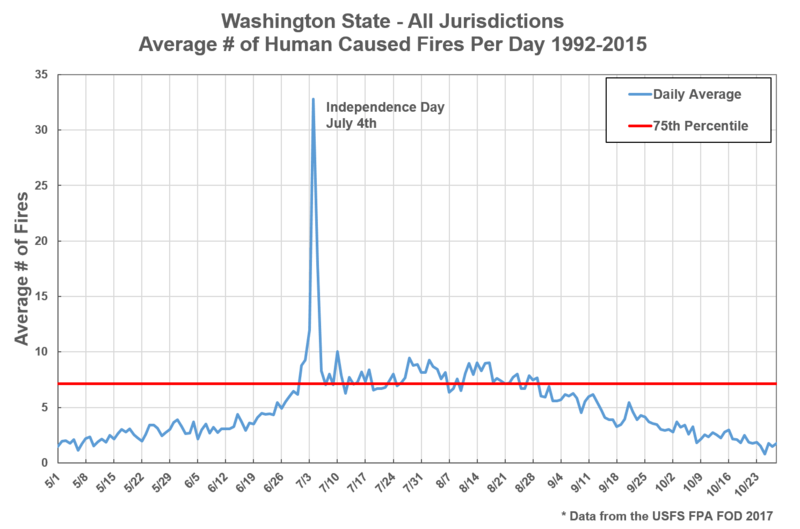 To illustrate this, take a look at a key air quality measurement (small particles that can move deep into your lungs, known as PM2.5) for Seattle's Beacon hill for July 2-8, 2017. Values surged to over 140, which is very unhealthy for vulnerable populations. 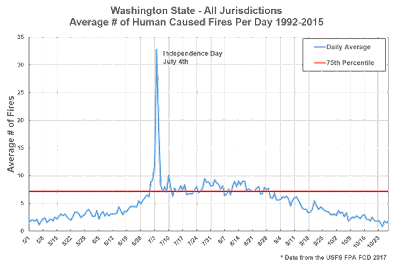 Other major cities and fireworks locations showed similar July 4 peaks. What about injuries? Thousands of people are burned, lose fingers, damage their eyes, and experience other traumas due to fireworks, many of them teenage boys. Here is a graph from the Journal of Surgical Research showing the number of hospital visits due to fireworks injuries (and I bet many more injuries are not reported). July 4th fireworks obviously play a major role. And then there is the terror that fireworks incite in domestic pets and wildlife. July 5th is historically the busiest day of the year at pet shelters. Many pets never return home. So what is the current situation on the ground and the forecast for July 4th? The latest wildfire danger map from Washington DNR shown high danger in much of eastern Washington, with moderate danger in the Columbia Gorge. The latest forecasts are for a warming trend tomorrow (July 4), with low to mid 80s in much of western Washington away from the water. We expect considerable cloudiness, particularly during the later part of the day. So decent weather to enjoy public fireworks. And a good time to avoid igniting fireworks yourself. Was that supposed to be "considerable sunshine?" Personal fireworks just ought to be banned. Its to bad but too may folks just can't be responsible. Fortunately fireworks are not legal in Okanogan county where I live. Unbelievably, they were and are at least partially legal in Benton county where I used to live. Every year (on the 4th) it sounded like a war zone with explosions and sirens until after mid-night. Last year, there were 102 fires sparked by fireworks across the state, resulting in an estimated loss of more than $2 million dollars, according to the Office of the State Fire Marshal. There also were 341 firework-related injuries, including six amputations and 31 cases where patients had first-degree burns. 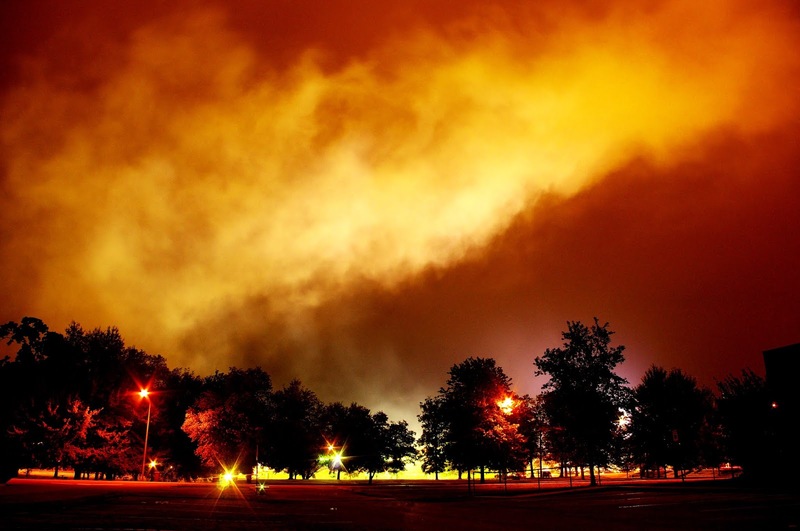 Some vets with PTSD also suffer from fireworks exploding. So injuries from fireworks in the US are highest in July? Who whudda thunk it? But fireworks are so much fun! And it's just one day a year. Can’t agree more! Why do don’t you hunt down your local representative and tell him/her? I would love to see personal fireworks banned across the state. The benefits do not outweigh the costs. Oregon is a free for all when it comes to local idiots blasting your head off at will, but my hometown of Chicago was the same way. Cops do nothing about any of it, even though Portland and the surrounding areas are now under a high wind warning, where conditions are ripe for man - made fires. Wonderful. I'm on the pro-fireworks side, personally. It's a lot of fun, and it's not that hard to be careful and responsible. We shouldn't give up freedom just to gain a little safety. I also think fireworks are alright, just use safe practices and pass those safety practices on to the kids. Agreed on fireworks. But how much of the air pollution on July 4 is fireworks and how much is just people grilling? Bingo - the excess smoke is caused by all the grilling going on. I had a hunch it was grilling, now I'm certain of it. If one want's to make big bangs and flashy explosions, join the military and you will get it out of your system. BTW, toxicological research has shown that many of the metallic particles in the smoke from fireworks are bio-reactive and can affect human health.